Niagara Falls may be the big attraction in Niagara Falls, Ontario but venture past all of the cheesy touristy stuff that is built up around the falls and there is a really amazing theme park just up the river. 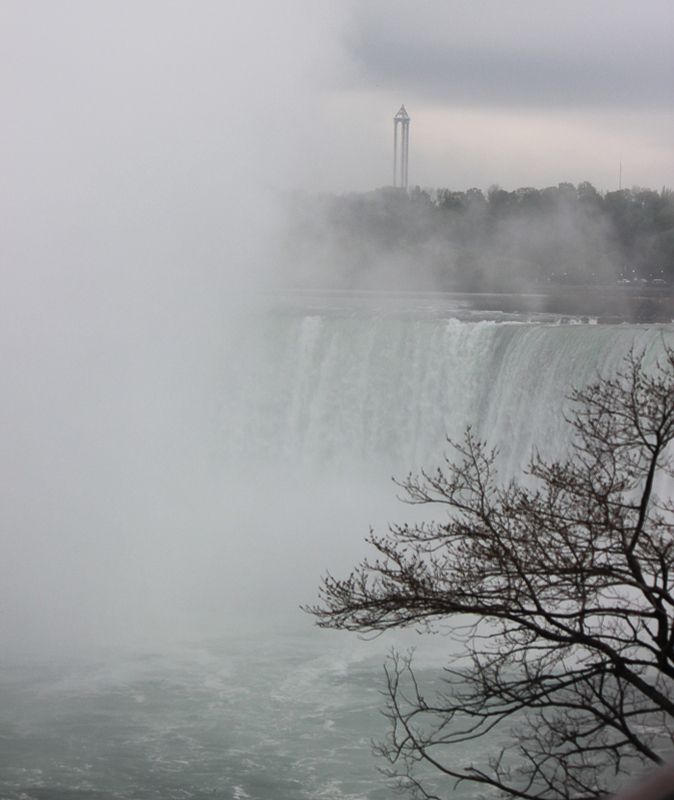 Marineland of Canada's Sky Screamer tower ride can be seen from the Falls and all around and it acts as a large billboard for the park. 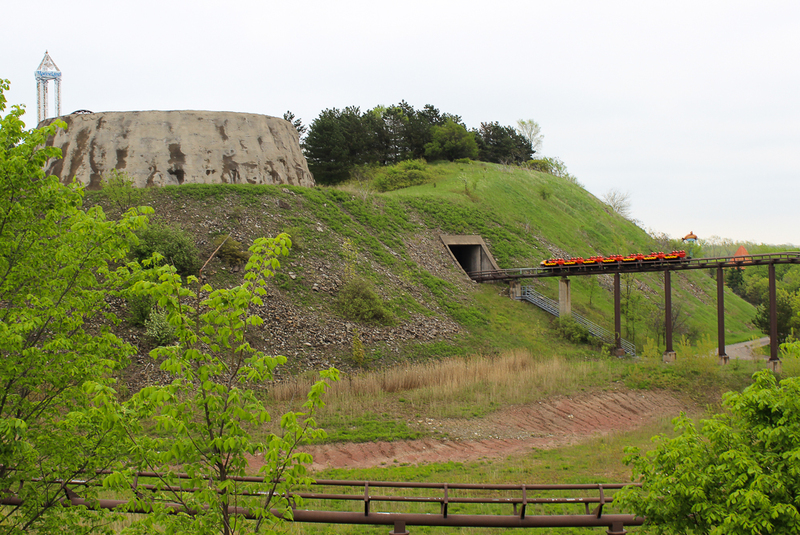 Marineland began in 1961 as a simple roadside attraction that was known as Marine Wonderland and Game Farm. There were sea lions, a swimming snow and deer costing a whole $.25 to visit. In the coming years Marineland has built slowly and steadily adding rides, animals, shows and other attractions. 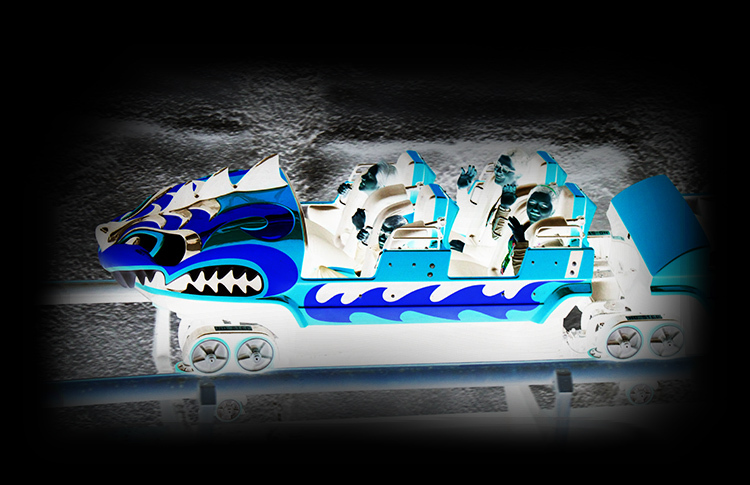 I have been wanting to visit Marineland for years to take its legendary Dragon Mountain coaster for a ride. When the chance to visit came up paired with a trip to Montreal for Negative-G Forum Member Paul "Bratman" Schroeder's wedding (dubbed the "SchroederCon" as coasters were included in the weekend festivities) I emailed Marineland asking if it would be possible to go back around Dragon Mountain in order to shoot it. 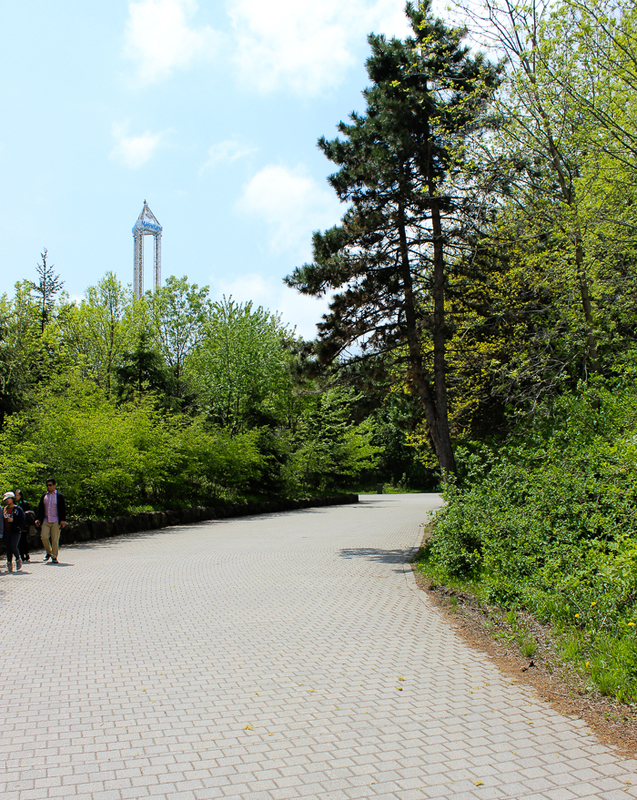 Because of its terrain you can't photograph or see much of it from inside the park. Marineland happily obliged and shortly after arriving Bond and I found ourselves being driven up to the top of Dragon Mountain. 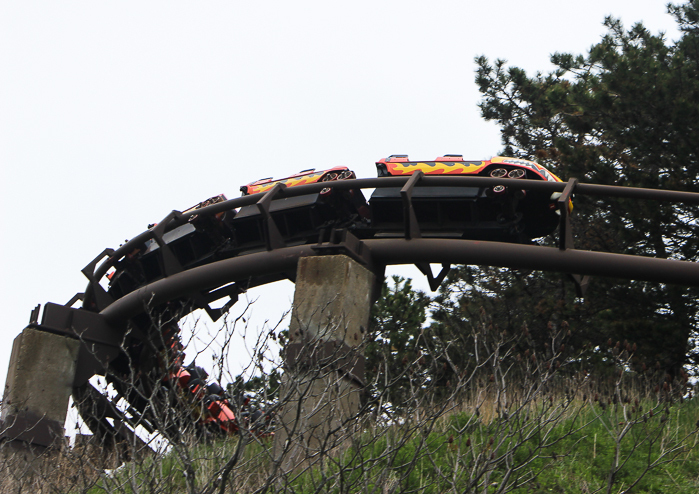 Dragon Mountain is a huge looping coaster designed by Arrow Dynamics that takes up a massive thirty acres of space. There are parks out there like Quassy, Indiana Beach or Arnolds Park that could all easily all fit in the space of land that Dragon Mountain takes up. 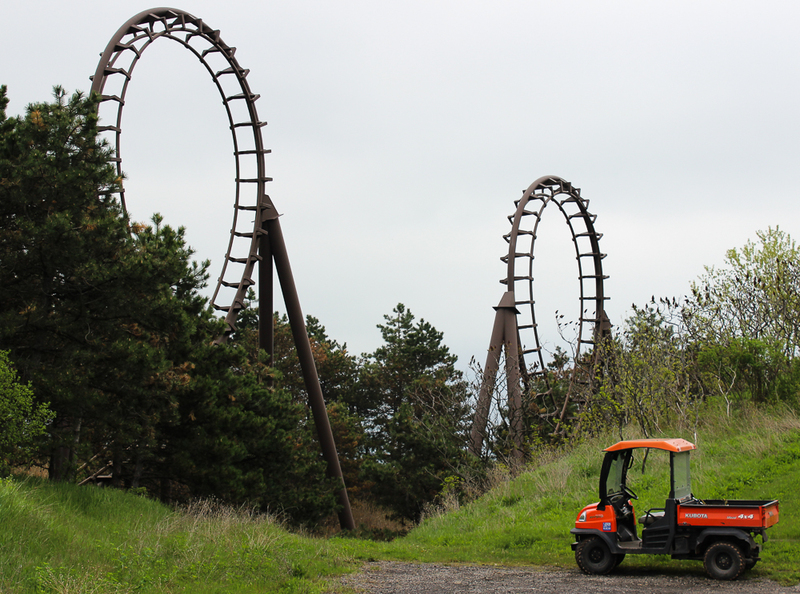 From 1983 when it opened until 1989 Dragon Mountain was the tallest coaster in the world at 186 feet tall. It actually has two lift motors and chains. Half they way up the lift hill you pass through a little building. That is where the first lift ends and the second one starts up. The design is interesting because on the lower side of the lift the chain is on the left side of the track and the anti-rollback is on the right. Once you switch to the second lift the lift chain and anti rollbacks positions are reversed but riders won't notice a thing as the transition is smooth. The reason for two lifts is simple the forces that cause wear and tear on two 93 foot lift chain is a lot less than one massive 186 foot tall lift chain.